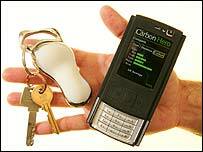 A British student has invented a way for people to track their own carbon footprint through their mobile phone. The Carbon Hero, designed by Royal College of Art graduate Andreas Zachariah, is a personal carbon calculator and works by tracking a person through their phone signal every time they go on a journey. This then allows the device to work out the method of transport the user is on, and from that calculate the amount of carbon dioxide going into the air as a result. "The idea is that, with around two billion mobile phones around the globe, it's quite simple that you're very likely not to be without one," Mr Zachariah told BBC World Service's Culture Shock programme. "As you move around, it tracks and identifies your movement, and tries to figure out what transport you are using." The Carbon Hero has already been awarded the British Standards Institute (BSI) prize for Sustainability Design. The invention is in two parts: a keychain which calculates the relative location, velocity and pattern of a user's activity and the mobile phone which displays the carbon used and the amount of credits needed to be purchased in order to offset the amount used. 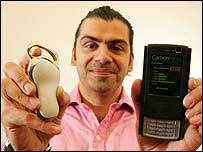 Mr Zachariah explained that he wanted the Carbon Hero to cause "minimum disruption" to the user, and so it works in the background of the phone. He also said that, although it tracks the user through their signal, this need not equate to fears about the information being shared. "I'm not a particularly big fan of big brother watching me, so one thing quite pertinent to me is the way the system works - it doesn't let anyone else know your movement," he said. "It's a private system; your privacy and security aren't compromised." Mr Zachariah added that the Carbon Hero can be "a lot more accurate" than any carbon calculator website. "A carbon calculator site will inform you like a snapshot - like going to the doctors and being asked 'how many units of alcohol did you drink, how many cigarettes did you smoke' and you rummage in your brain and come up with something. "This is quite a leap, because unlike a carbon calculator site, this actually does it in the background for you, working out how much you drank and cigarettes you smoked." The device is currently configured to work in the UK, although it has also incorporated 1,000 thousand airports from around the world. In theory, a person can travel anywhere and have their journey included in the carbon footprint calculation as well. Mr Zachariah said that he is now working with a number of people to exploit commercial potential from the device. "I'm already seeing people who understand the opportunity that this represents. "We're in interesting times. What I really like is that there is tremendous goodwill out there, and people really want to start to make a difference. "If you look at the UK last year, 140,000 people voluntarily offset their flights. So the consumer is pushing and engaging the organisations."